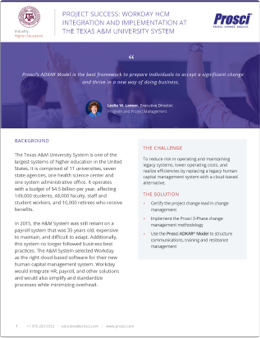 In 2015, the Texas A&M University System was still reliant on a payroll system that was 35 years old, expensive to maintain, and difficult to adapt. Additionally, this system no longer followed business best practices. The A&M System selected Workday as the right cloud-based software for their new human capital management system. Workday would integrate HR, payroll, and other solutions and would also simplify and standardize processes while minimizing overhead. Prosci’s ADKAR® Model is the best framework to prepare individuals to accept a significant change and thrive in a new way of doing business. To reduce risk in operating and maintaining legacy systems, lower operating costs, and realize efficiencies by replacing a legacy human capital management system with a cloud-based alternative. Using the Prosci 3-Phase Process and Prosci ADKAR Model as guides, a core group focused on change management began outlining a change management plan with the goal of integrating it with the project team’s milestones. Following change management best practices, the change management team assessed change impacts and likely areas of resistance. They tailored special tactics to address the most universally anticipated resistance points. For example, to address resistance to change caused by unfamiliarity with the new software and processes, the change management team ensured that all major changes were communicated before training. They also ensured that the most impacted employees heard about key changes three to five times before go-live. In addition, coaches with expertise in Workday’s business processes and security roles met with each member over a 13-week period to review the most common business processes and surface resistance and questions. There was another area of resistance that would prove more difficult to mitigate: many employees identified first with their university or agency and second (if at all) with the overarching A&M System. They were, therefore, wary of changes brought in from the System Office and did not respond to sponsorship from this office. To address this, the team brought together the HR Officer and Chief Financial Officer of each of the system’s 11 universities, seven state agencies and the health science center to become part of an Executive Advisory Committee (EAC). These representatives provided executive level buy-in, provided input on all major decisions, and formally accepted the design, the prototypes, and the system testing results. They became sustaining sponsors of the change throughout the project. Discover other results and details on change management application - including how the team measured change management success - when you download the full story as a PDF. Texas A&M University System selected Workday as the right cloud-based software for their new human capital management system. Because the Workday implementation would impact over 58,000 end users, the project team decided to apply a formal change management approach for the first time at the A&M System.